Brooklyn, NY – On Sunday night, January 16, 2011, over two thousand supporters of the Rofeh Cholim Cancer Society (RCCS) are expected to jam the Ateres Chaya ballroom in response to the record number of cancer-stricken patients seeking insurance assistance and other life-saving services offered by RCCS. Intake workers at RCCS report a never-before-seen-pace of calls and applications flooding the RCCS switchboard and receptionist desks. As each patient receives, on average, between $30,000 and $200,000 over the course of their illness, RCCS has no choice but continue to seek additional sources of funding to keep up with the pace. As Loeb and Troper are the financial auditors for RCCS, every dollar is accounted for; since it’s inception, RCCS has spent over $25 million dollars on behalf of its patients! Reb Herschel Kohn, founder and president of RCCS who will be speaking at the dinner, emphatically states that this is the best way to help cancer patients. As an insurance company typically pays approximately 20 times the amount of an average policy, the leverage for patients is maximal, allowing them access to the best possible medical care. Attendees at the dinner will have the added enjoyment of hearing the world-famous Chazzan, Itche Meir Helfgott, regale the audience with his unique voice and songs of chazzonus. Not only that but composer, lyricist and badchan Moti Illowitz will also perform. 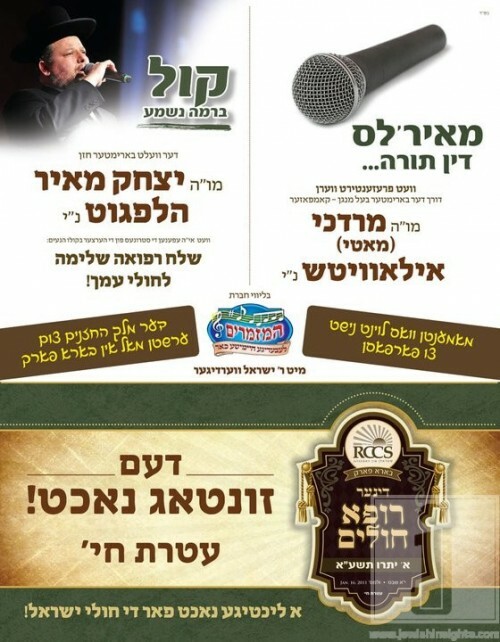 The world renown HaMezamrim Choir joined by Yisroel Werdyger will be there too. The featured honoree at the dinner will be the world-renowned hematologist and oncologist, Dr. Morton Coleman, Director of the Center for Lymphoma and Myeloma, NY Presbyterian Hospital – Weill Cornell Campus. Also feted will be several “askanim” and hospital liaisons: Rabbi Yitzchok Twersky, Rabbi Benzion Leser of Maimonides Medical Center, and Rabbi Meyer Leifer and Rabbi Tully Reiner of Lutheran HealthCare. There will be an array of prominent speakers, including the Novominsker Rebbe, shlit”a, Harav Yaakov Perlow, who serves as the RCCS Rabbinical Chairman. The dinner at Ateres Chaya Hall, 1415 54th Street in the Boro Park section of Brooklyn, will begin at 7:00PM; reservations are not required. To place a journal ad or to join in helping cancer patients overcome their life-threatening illness, please call 718.RCC.2002.